Specializing in vocal-instrumental music of the 17th and 18th centuries, New Trinity Baroque's mission is to promote and revive the music before 1800s, through inspiring and exciting concert performances on period instruments, recordings, and educational programs, in hope to instill in people a true understanding and love for music of the earlier repertoire, and give birth to another Renaissance in the arts. 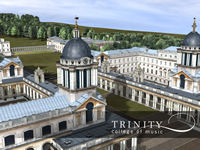 NEW TRINITY BAROQUE was founded in London, United Kingdom, by Predrag Gosta, at the time when he was completing his postgraduate studies at Trinity College of Music. Soon after its debut at St. Martin-in-the-Fields in March of 1998, and after the ensemble’s founder and director moved to the United States, New Trinity Baroque continued its mission based in Atlanta, Georgia. With frequent guest soloists of an international reputation, New Trinity Baroque presents on average twenty concerts per season in Atlanta, with many more in other cities throughout the United States. Highlight performances include Monteverdi’s “Vespers” and “Selva Morale,” Handel’s “Gloria,” Purcell’s “Dido & Aeneas” with famous soprano Evelyn Tubb in the title role, Bach’s & Telemann’s Orchestral Suites, and Concerti Grossi by Corelli, Handel, Muffat and Geminiani. The ensemble also presents concert-lectures, most notably at Georgia State University, where they were recently appointed the “ensemble in residence”. Working under the patronage of Early Music Network, New Trinity Baroque has, since 1998, recorded five CDs [see discography]. They were also a semi-finalist of the Concert Artists Guild International Competition in New York City (March 2003), and in June 2003, they attended the Boston Early Music Festival, presenting a concert with Italian, Croatian, German and English repertoire. New Trinity Baroque Inc. is incorporated as a non-profit corporation in the State of Georgia, as well as in the State of Delaware. With its headquarters in Atlanta, New Trinity Baroque Inc. is licensed to conduct its business throughout the State of Georgia, the United States and the world.